Focused solely on Latino registered voters in the city of Chicago—the timely polling effort, Chicago Latino Voters and the 2015 Mayoral Runoff, conducted by Latino Decisions and co-sponsored by Latino Policy Forum, National Alliance of Latin American and Caribbean Communities (NALACC) and Univision Chicago—was released Monday, March 23, 2015 at a town hall held at 541 N. Fairbanks Court. Although there are more than 240,000 registered Latino voters in Chicago— an increase of 25 percent since 2008—they are consistently under-polled. As Chicago faces its first mayoral runoff election in history, the new poll shows Latino voters are enthusiastic and closely following news about the candidates and issues. 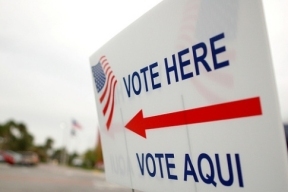 The poll found Latino voters demonstrate an exceptional level of interest in April’s election. When asked how enthusiastic they were in casting a vote in the upcoming race, 85 percent said they were very or somewhat enthusiastic. The survey found that, similar to many voters, Latino Chicagoans priority issues are education, violence, and job creation. The poll also found that one of every five Latino voters surveyed is still undecided. Sixty-one percent said they will vote for Jesus “Chuy” Garcia and 18 percent for Rahm Emanuel. Latino Decisions surveyed a representative sample of 406 Latino registered voters in the city of Chicago March 16-20, 2015. Surveys were implemented to randomly selected phone numbers, conducted via live, person to person (i.e. not robocalls) phone calls. The poll was sponsored by a group of local nonpartisan organizations.